OK – I know I’m crap at marketing, but I’m great at re-cycling! 😀 Treat this as ‘another chance to see’ the recent blog tour that launched the eBook, only in it’s spiritual home (well at least where it was written, since it’s permanently on display on the actual book blog). The printed edition is now well and truly out there, sailing down that big ole river and out onto the oceans of literary consciousness, so let’s mooch around in style for several days worth of freebooting-related postings. Banana Daquiri anyone? Even if I wasn’t a graphic designer by trade, as every author knows (whether or not they’re a best-selling one! ), books are judged by their covers, especially if it’s a bad one! 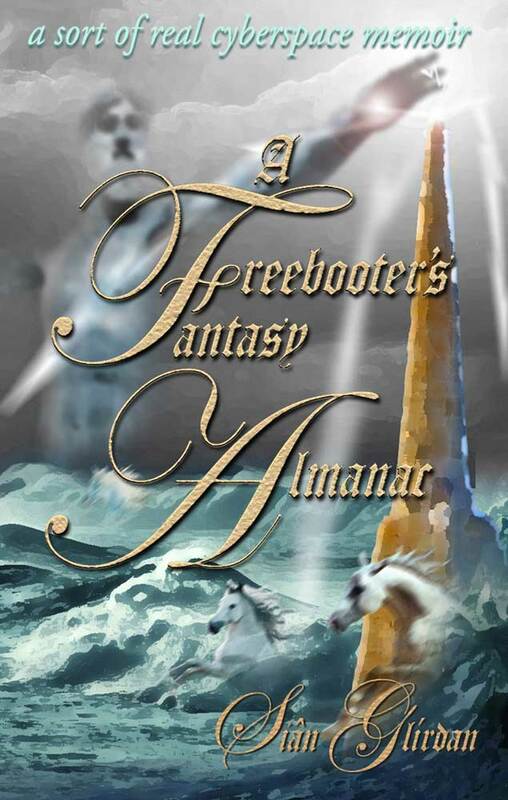 Once I’d decided on my quirky title for A Freebooter’s Fantasy Almanac, I then had to think long and hard about how to convey what’s in the book visually. With fantasy to the fore in the title, this left me with a certain amount of leeway for interpreting the buccaneering approach to imaginative reinvention… There was also the ‘real world’ aspect, in that fantasy writing and roleplay was wonderful therapy for my recovery and reconstruction of my true personality. Whatever made the cover had to reflect those themes strongly. In contrast to my earliest obsession with mythology and fantasy, real life teaches us that good isn’t always triumphant and that the flip side of dreaming is having nightmares. So I started to ponder on the nature of fate and the fantastic. On how life can also take you to places you never expected, or even wanted to go to. I concentrated on those four cards, because they all scoped in the freebooting concept in some way (The Hierophant was inspired by Odin, the one-eyed Allfather of Norse myth, which also has strong links to Middle Earth). However, because I’d chosen a lighthouse and a wild seascape, complete with white horses in the waves and Poseidon in the background for the Tower, this literally blasted the competition out of the water with its connotations of catastrophic events and fantasmagorical creatures! How much swash-buckling can you take? Typography is another of my passions. My father was a traditional sign-writer and maker so fonts had always been on my radar, along with paint and brushes from the moment I could hold a crayon. Because my brand of fantasy leans very much to the gothic and often the ‘romantic’, I chose two distinct styles to fuse together into a pleasing assemblage with the imagery, and my cover solution was complete! All tarot cards have several meanings, but the literal fate of all thieves is the classic interpretation and so suited the piratical theming! On Norse tarot decks, Odin is often depicted as The Seer because of his visionary aspect. For the back cover I chose a more obvious pirate image, that’s continued into the book as a device to separate longer sections, and coupled that with the main title artwork.